Phasis provides special scissors: the Swissors 500 made by Wenger SA, a Swiss company producing the Swiss army knife. Mica is a very hard material and thus difficult to cut. Mica pieces are usually prepared by die cutting with special carbide tools that are not available to our customers cutting mica in the laboratory. 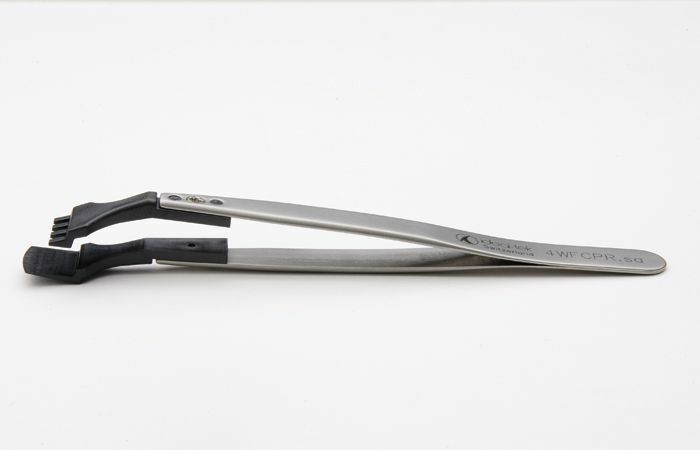 To help customers who need to cut mica, Phasis provides special scissors made by Wenger SA, a Swiss company fabricating the famous Swiss army knife. The scissors have blades with a titanium nitride coating layer improving the cutting process. With those scissors you will minimise the edge fracturing on the mica compared to the cutting with standard scissors. Phasis also provide separated blades that can be changed on the scissors once the blades are worn out. While cutting mica, wear adequate eyes protections. Customers have to be cautious not to touch or destroy the gold surface and to minimise the number of particles falling onto the gold surface during the cutting process. Pay also attention not to bend the samples during the cutting process. Phasis also provides special tweezers made by Ideal-Tek SA, another Swiss company. These tweezers are ideal for the gold on mica products. They have indeed very fine tips made of plastic with a high rigidity and good chemical resistance. With these tips you will reduce the possibility scratching or destroying your samples while being able to hold your sample in a secure way.